Hello! Today I spent the day watching my boyfriend and his father wrap their giant Christmas tree in lights. It was quite a production, but turned out very pretty. My favorite are the globey lights, they look like planets. Quickly lit candles, now we're off to happy hour with bf's friends from high school. Rumor has it there will be bowling, so I might have some good photos for you tomorrow. 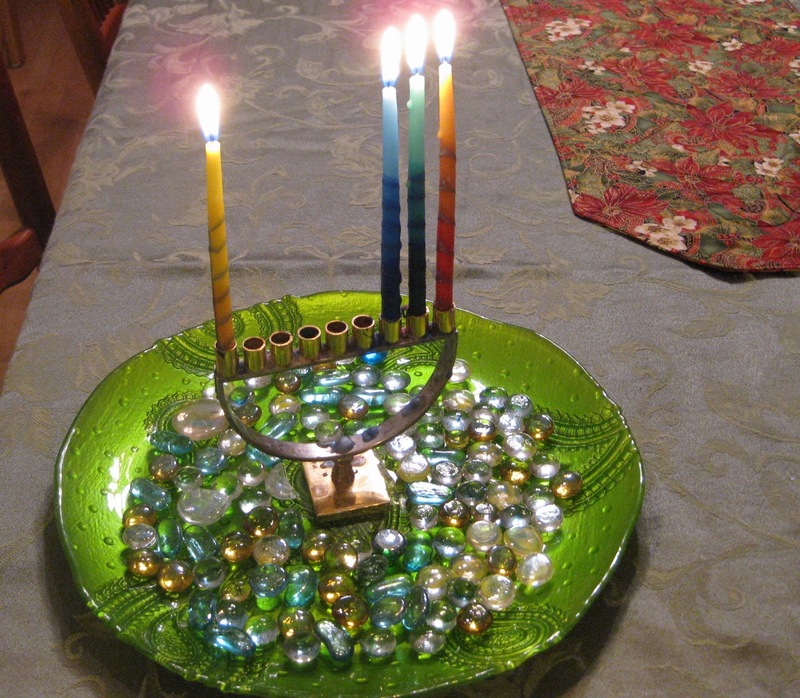 My boyfriend's mom put my menorah on this pretty plate with glass beads, way nicer than the tin foil I usually use. Q: Do you play Dreidel? A: So the game of Dreidel comes from Jewish kids in the time of the Maccabees. They would get together for the purpose of studying Torah (which was forbidden under Greek rule) and then if any Greek soldiers came around, they would hide the books and pull out the Dreidels and Gelt (Yiddish word for money) as a decoy. Dreidel is a simple gambling game. Depending which side of the Dreidel landed up, you either put in or take money out of the pot. 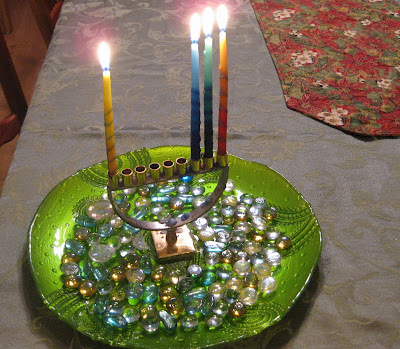 Modern Dreidels are inscribed with Hebrew letters as shown below, the first letter of each word in a Hebrew phrase which means "A great miracle happened there." We often play the Dreidel game on Hannukah, using either pennies or candies (little chocolate coins or M&Ms) as our gambling chips. Here's the way we play. I'm sure there are hundreds of variations. As long as you agree on the rules before it starts, you're good to go. Everyone starts with 10 pieces of whatever you're using to play the game. Everyone puts in one piece to start. Then players take turns spinning the dreidel. Nun (the far right letter) - do nothing. Gimmel (second to the right) - get the pot. We say this is because Gimmel is like "gimme." Don't know if that's the real reason why. Hay (third from the right) - take half the pot. Or alternately, give half your stuff to the pot. Depends how fast we want the game to go. Shin- (on the left) - put 2 into the pot.